Project for the complete renovation of a detached house on the heights of the Tigullio headland, not far from the ligurian capital. 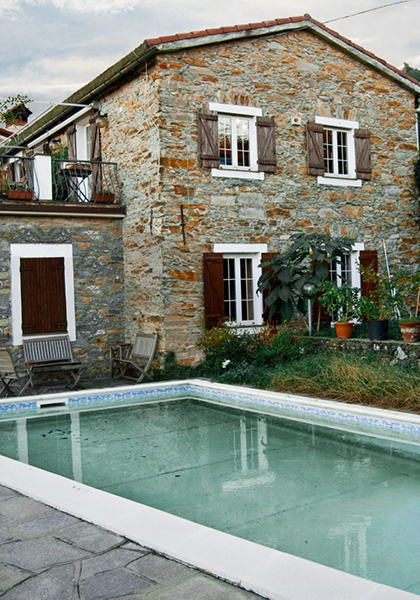 According to the common typology of ligurian territory, the disposition, today, presents the entrance to the living on the first floor and the whole sleeping area on the ground floor with a direct connection to the garden and its swimming pool. The client request was to completely overturn the interior layout to best serve the outer space. Maintaining the same bedrooms number, the project provides a wide living connected to the kitchen with a dedicated access to the outside. On the same floor has been obtained a double bedroom with dedicated entrance and a private bathroom, another wc for the entire floor and a laundry. The stairs problem has been solved considering it as an essential element of the project and has been designed ad-hoc as a storage device made by concrete and wood that reaches the first floor defining the studio/working space which characterizes the access corridor to the two bedrooms and the third bathroom. The garden has been enhanced with a new metallic bower, lighter than the old one that now guides to the new Q-house entrance.